Maximize your home's storage space with the Nashbar Steel Bike Rack. The stand-alone design holds two bikes and can work in any room. The heavy duty, steel construction is built to last and is a no-nonsense way to get your bikes up off the floor. 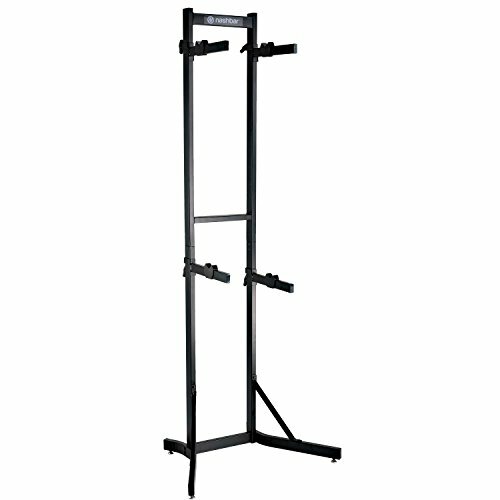 And since it's a free-standing unit, moving the rack from room to room is a simple endeavor. The soft rubber cradles ensure your bikes' frames receive plenty of TLC while the adjustable arms means the rack is easily adaptable to bikes with traditional level top tubes or today's sloping top tubes.